Birchbox is a monthly themed (somewhat) subscription service for beauty and makeup products, they seem to focus on makeup, skincare, with a fragrance thrown in. 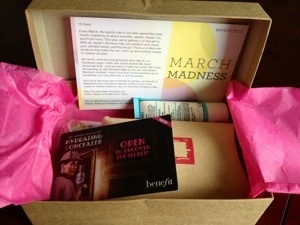 Each month you will receive 4-5 larger sized samples with some full size beauty products too. The subscription costs are: 1 monthly box– $10.00, 3 month subscription – $30.00, 6 month – $60.00, 12 month – $110.00 ($9.16 per box) and all include free shipping. Woo Hoo! 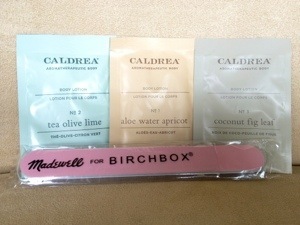 My Birchbox is here! Time to get my beauty on! This month’s theme is March Madness!! Very fitting, did any of you join a bracket? 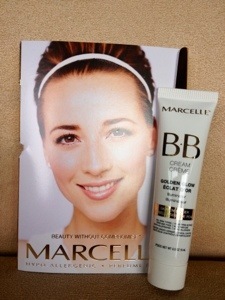 I am very excited to try this, but am a little skeptical because it is suppose to be a one color fits all – I sure hope so! The scents sound interesting and relaxing! They seem to have a whole line of household products as well! These are always handy to have on hand, and with my new home manicure obsession, this will definitely get used! I can’t wait to try this! They also have products that help calm and prevent ingrown hair and another one that helps inhibit hair growth! Seeing as I am not visiting a laser for permanent hair removal anytime soon, I may be checking out these products in the very near future!! I really hope this works, I have a few spots that like to pop up periodically so this is a welcome addition!! I haven’t tried this yet, but I do like the company and have high hopes for it’s performance! 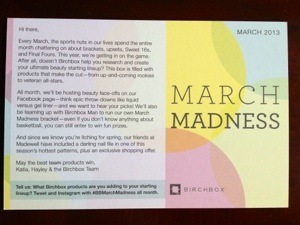 The approximate value of March’s Birchbox is $30.90. This is much better than last month value and well above what I spent! I am still very happy with my subscription and look forward to next month’s box.